Pavement is the only band I know that can make you feel like you’re walking on clouds, owning the world, and living life for all it’s worth—and then also guide you through the darkest holes of the saddest depression. Pavement can be angry, crazy, and noisy, but always with hefty chunks of pop breaking through, fighting for air. A band for all seasons? I guess…. The cancellation of an Orlando date prompted a friend and I to trek the 120 miles to Gainesville’s Florida Theater for this momentous concert event. Personally, I would have traveled 1,020 miles to see Pavement. Matador Records’ Bailter Space is a trio originally from the noise-music hotbed New Zealand, now currently setting up shop in New York City. The band consists of a texturous, somewhat monotonous (yet not boring at all) noise grind similar to those British shoegazers My Bloody Valentine or Ride. The band was tight but loose with little variation in drum beats, but variation was never a prerequisite for any great bands. Bailter Space played what seemed like one long song, but that one song was a very good one. So I have no complaints. Pavement came on last. As the band drove into the first song, “Heaven Is a Truck,” big smiles appeared on all faces: the members of Pavement, the crowd. I even saw the sound guy with a big ole silly sheepish grin plastered on his face. 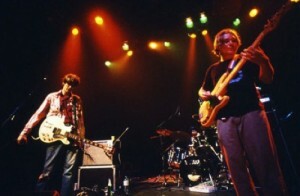 Pavement stayed true to its latest album, playing all but three from Crooked Rain, Crooked Rain. Fans who came to hear Slanted and Enchanted Part Two may have been a little disappointed because the band recollected only a handful of the old favorites like “Box Elder,” “Trigger Cut,” and “Heckler Spray.” One fan in close proximity to me kept calling out for “Forklift,” but even as the singer/guitarist Stephen Malkmus said early on—that the concert’s road ahead was a long one—the band never did get around to that particular tune. Also, the four gems found on the Watery, Domestic EP were ignored. Making up for that, Pavement played about four or five brand spanking new tunes that are destined to become classics. The bandleader Malkmus is to the indie-rock kids as Morrissey is to the chronically depressed: mysterious and misunderstood, the tortured artist, the anybody kid who just happened to stumble upon unintentional fame and fortune. Decked out in a Bruce Lee Underoos tee shirt, he acted out the role of the kid who never left the sandbox. Like Peter Pan, Malkmus never wanted to grow up. His onstage personality reminded me of a sixth grader in the schoolyard playground: he did jumping jacks, shook his hair, and twisted his whole body around all while playing the guitar. His between-song comments were as vague and cryptic as the album covers he designs. “Cameroon, not in the World Cup this year” was one, and while squinting he firmly stated, “My eyelids at half mast.” Genius or madman? You decide. 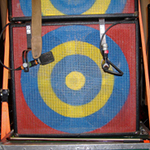 The songs “Debris Slide” and “Silence Kit” had the crowd a-jumpin’ and a-moshin’ while others, such as “In the Mouth a Desert” and a couple new ones, stopped fans dead in their tracks. In fact, the band mentioned they had a new EP coming out pretty soon. Malkmus, maybe in realizing the silliness of Pavement having a hit single and an MTV video, changed a line in “Cut Your Hair” from “that’s a pretty nice haircut” to “that’s a pretty cheap haircut.” Yet the band did a two-song encore, just like real rock stars do, performing “Summer Babe” and the clincher of Crooked Rain, Crooked Rain, “Fillmore Jive,” where Malkmus fell to the floor screaming “I hate my parents/neighbors/sisters” (insert just about anything here) in the closing moments of the tune. The band hit the last jarring note and exited the stage. I and a few hundred others had just witnessed the perfect sound forever.